Fulton Farm is an environmental educational facility and a working produce farm. Nestled within the 50 acre property of the Fulton Center for Sustainability Studies, the farm’s seven acres of fields and gardens produce crops for the campus and the community. Vegetables, fruits, flowers and herbs are raised without chemical pesticides, herbicides or fertilizers. The farm is USDA certified organic as well as third-party verified by Certified Naturally Grown. Farm staff, students and members of the community come together to plant, nurture and eat the healthful food produced right on campus. Use a minimal amount of non-renewable resources. Promote biodiversity on the farm. Ensure farm-worker safety and health. Provide healthy, locally produced food for the campus and community. The College Dining Hall purchases salad greens, tomatoes, and other specialty crops in season. Cherry tomatoes are a big hit at the salad bar! The Community Supported Agriculture (CSA) program is our biggest produce outlet. Over 125 families from the community “join the farm” each year as members, and are provided with fresh food weekly throughout the farm season. Members have the option to work on the farm for discounts, pick some extra crops, walk the gardens, and participate in farm events. The North Square Farmers Market on North Main Street Rt. 11 in Chambersburg is a fun family event. Saturday mornings throughout the summer, farm staff and students offer the fruits of their labors to the community. The North Square Farmers Market is open every Saturday from 8 a.m. to 12 p.m. May through October. Our campus market stand at Lenfest Commons on the Wilson Campus is open to students, staff, faculty and the public from 11 a.m. to 1 p.m. on Wednesdays, June through November. Fulton Farm offers vast opportunities for student and community education. Students use the farm for classes, internships, work-study jobs, and volunteer service hours. Gardening for Fitness: Students cultivate the soil and raise their own produce and flower gardens from start to finish. This course also qualifies for Physical Education credits! Agroecology: Exploring the science of ecology through the lens of agriculture, agroecology students study the organisms interacting within the farm ecosystem with the goal of understanding sustainable food production. Permaculture Design: Permaculture teaches the principles of creating sustainable human settlements. This summer course has a strong hands-on component, wherein students construct a project to promote biodiversity and food production, as well as design their own permaculture homestead. Community members also come to the farm to learn! The farm hosts frequent workshops and events that are open to the public, including composting and gardening demonstrations, and cooking classes for members of the CSA. The farm offers full and part-season internships for people with a desire to learn first hand the art and practice of sustainable farming. Interns work and live on the farm, discuss and learn techniques, and visit other farms in the area as a part of this diverse and effective educational program. Volunteers are also welcomed and needed! The farm has fresh produce to trade for those who would like to donate their time to help with planting, weeding, watering, and harvesting our prolific crops. Fulton Farm is a fun place to get your hands dirty, meet other people interested in healthy living, and reconnect with your food supply! 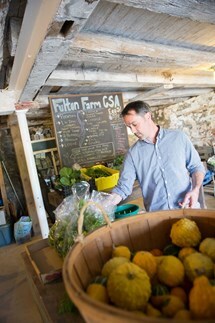 Wilson's Fulton Farm profiled in the latest issue of Local Magazine.